Roulette is a game that provides second-to-none experience to its fans. The adrenaline, which every player feels in expecting to hear which is the winning number is indescribable. That is the reason why the game has “conquered” not only the brick-and-mortar casinos, but also the Internet. More and more people are playing this exciting game, testing their luck. Of course, everybody is familiar with the fact that roulette is a game of chance, so that no event is predictable by use of some strategy. Even though there are no winning hacks for the game, it is a good idea to know how it is carried out. Roulette has been played for years, so that its rules are well-established. At first sight, it may look all Greek to the inexperienced player, but it is not hard to grasp the basic rules of the game. The main purpose of every player is to guess as much accurate as possible which numbered pocket the ball will land on. Even if you have never entered a casino, it is impossible to mistake the game of roulette. The spinning wheel has become iconic to the game. The wheel itself consists of two main parts – the outer part is called bowl and the inner one is called the wheelhead. Every wheel consists of numbered pockets, which cover the numbers from 1 to 36, not in a consecutive order. On the American wheel, the pockets are 38 in total due to the presence of two zero-numbered pockets, while the European and French wheels consist of 37 pockets and only one zero-numbered pocket. The pockets are alternately colored in black and red, and the zero-numbered pockets are colored in green. The dealer tosses a ball in the opposite direction of the wheel’s rotation. Besides the wheel, the table consists of a betting layout, where all players place their bets. The dealer, also called a croupier, manages the layout. Usually, the American and European table are arranged in a very similar way, the only difference being in the double-ended layout in the American layout, which represents the second zero-pocket. On some French tables, though, you can notice that the wheel is placed in the middle of the layout. Every layout consists of two parts – inside (it contains all the numbers on the wheel) and outside (it consists of different categories). In the American and European variations, the outside betting section of the layout is positioned on the same long side of the table. But on the French table, the outside part is split between the two long sides of the table. This allows more participants to join. The most important thing is to find a strategic seat, which will provide you access to all the betting sections, which are available on the layout. For that purpose, it would be best to take a central seat in front. Once you get the right position, you need to provide yourself with chips for the game. The player can buy chips directly from the dealer or the cashier. The chips of every player are of different color. The reason is that all players place their chips on the table and these can be easily mixed up with each other. The purpose of the different colors is to differentiate the chips of every player. It should be noted that it is allowed to play with the regular casino chips, but only if a limited amount of people are playing. Otherwise, the stacks of chips may confuse both players and dealers. After you finish playing the game, only the croupier is allowed to exchange the roulette chips with the regular casino ones. The value of every chip is marked by the dealer and it depends on what you have paid for it. The player has no right to remove the colored roulette chips from the table and these cannot be used on another table, anyway. The very first thing done in a game of roulette is the placing of bets. If you are playing online roulette, you can take your time with this step. If you are playing in a casino, you have to place your bet before the dealer says “no more bets”. This is usually said when the ball starts to slow down. To place your bet, you need to put your chips on the number, group of numbers or section, which you wish to bet on. If the bet consists of more than one chip, you place the chips in a stack. To place a bet for the next spin, you need to wait until the croupier pays all the winning bets, collects the losing ones and removes the win marker from the layout. Every table is governed by different minimum and maximum betting limits, which are noted on a small sign on the table. The wording on the sign in every casino might be different, but they all refer to one and the same thing. Understanding that aspect is essential for playing roulette, since every player should place bets, which are within these requirements. Minimum bets are usually pretty low, generally around $5. Note that you cannot combine your inner and outer bets to meet the minimum. So for instance if the minimum bet was $5, you could not bet $2.50 inner and $2.50 outer. On the other hand, you are allowed to place multiple bets (both inside and outside), and it is a good idea to spread out your bets. Inside bets are harder to win, but the payouts are much better. The same thing applies to the maximum bets. However, there is sometimes a different maximum limit for each type of bet. Generally, the limit on inside bets is lower, as the odds are much better. In that way, the house puts a limit on the amount of money, which the player can win and protects itself from long-term losses. Generally speaking, we may outline two major type of bets, which are common for all three variations of the game. As we already mentioned above, the layout consists of two parts, which represents the so-called “inside” and “outside” bets. Outside bets are much easier to win, but therefore, have much lower payouts. Outside bets are: 1-18 (pays 1:1), 19-36 (pays 1:1), red or black (pays 1:1), dozen bets – either 1-12, 13-24, or 25-36 (pays 2:1), even or odd (pays 1:1), and column (pays 1:1). Outside bets are relatively safe, they will never earn you much, but also never lose you much. For example, a $5 bet on black would give you $5, while a $5 straight-up bet would net you $175! There are many inside bets to choose from, but straight-up (1 number), split (2 numbers), and street (3 numbers) are the most common. This type of bet is based on a particular number or combination of numbers by placing the chips on the right place of the inside section of the layout mat. With this type of bet, a single chip or couple of chips can cover two to six numbers, depending on the bet you place. The point is that the larger section of the layout you cover, the lower the payout is. Some casinos provide the players with the possibility to win an even-money bet, when the ball lands on a zero- or a double-zero pocket. This, of course, is specified by the rules of the casino, so every gambler needs to take into account the uniqueness of the table. The following lines are devoted to represent briefly these rules. This means that when the winning number is 0, the player has the right to leave the entire bet for the next spin, without changing it. That is the reason why it is called “in jail”, because the player is not allowed to change the initial bet. In case that the winning number is 0 again, all bets are lost. Otherwise, the bet either wins or loses in accordance with the usual rules of the game. 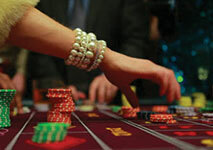 This reduces the profit of the casino from 2.70% to 1.35%, which is advantageous to the player. This rule is valid if the wining number is 0 and it allows the player to keep half of the bet and leave the other half to the house. The house profit is again 1.35% for even-money outside bets. These two rules are closely related to the French tables, but they are also applicable even on some European ones. Before taking a seat at the roulette table, make sure that you are familiar with the specific rules, that govern the particular table. This rule is in effect on the American table and it is just the same as the Le Partage rule with the slight difference that it is applicable if the winning number is 0 or 00. It also halves the house advantage from 5.26% to 2.63%. When you first approach the roulette table, do not forget to stay disciplined, without being overwhelmed by excitement. Start with buying chips from the dealer, keeping in mind that the best moment to do that is when the croupier has finished making payouts and the win marker is removed. Do not forget to be reasonable when you place your bets and wager amounts of money, which meet the limits of the table. Last, but not least, keep in mind that whenever you decide to leave the table, you need to cash in your chips. Do not take any colored chips from the table! The game is greatly dependent on luck, but also on the right money management. To avoid any pressure, it would be best to try and play online, since there will be no noises to distract you. This is a good choice, especially for amateur players.